• “What am I doing wrong? • “I love my child, but ____________. … or just want to have the best possible relationship with your child, ‘Parenting, The Joy of Doing It Right‘ will offer the solution. “The Relationship Saver“, does it again. how you might’ve done something different. I am telling you that you too can have a great relationship with your child regardless of the present situation. It is never too late to rekindle a close relationship with your child even if he/she is a teenager or even older. this information is equally pertinent. a happy relationship with their child. Look, there is no perfect parent/child relationship. Life isn’t all sunshine and buttercups. But a happy relationship with your child is a very real thing, and you deserve to have such a happy and healthy relationship. I can show you exactly how to relate to your child and achieve a lasting and healthy bond that will never break.Do you remember the feeling you had when you first saw your child as a newborn? There was nothing but love present. You understood your child completely, way before he/she uttered their first word.As your child grows and goes through each developmental stage, so does miscommunication set in. Your child is developing his/her personality and is maybe becoming rebellious or mischievous, and sometimes it seems that things are getting out of hand. Your relationship with your child starts to change. Confrontations are more frequent and emotions run unabated. Inevitably at some point you ask yourself, what am I doing wrong? Why is my child turning out to be someone I don’t know and is behaving in a way that I never intended? Almost everyone encounters some sort of parenting problem from time to time. The reason is simple: just as in love relationships, you are most likely given absolutely no training! In every other area of human development we are given some formal training. In high school you were educated about everything: history, math, science, literature, etc., but no one ever explained the basic principles of parenting and relationships to you. So, in essence, you are left to fend for yourself. Ever since you had your child you were developing a relationship with him/her the best you knew how. And we spend the rest of our lives as parents doing our best relying on our intuition, instinct and what we have learned as children from our parents. The problem is we only remember some of it when we were young and none of it when we were babies. Even what we do remember is skewed by our yet undeveloped young mind. Are You Guilty of These Parenting Errors? Because no one ever seriously taught you how to communicate with your child, it’s only natural to make some mistakes. Unless you know how to quickly correct them, these mistakes often destroy your relationship with your child, and/or create some negative personality traits that may show up at a later age. Ironically, these mistakes seem like the right thing to do at the time, but if you are trying any of these common (but destructive) tactics you are slowly damaging your child’s psyche, and killing your relationship with your child in the long run. You may have the best intentions and children will put up with anything when they are still very young, but your often-unknowing wrongdoing will mess up your relationship with your child in later years. With just a few basic principles you can avoid parenting pitfalls, so that your child will grow up to be a happy, fully functional and healthy adult. That’s right – you can bring up your child with ease and have a lifelong healthy relationship with him/her if you just follow the simple principles described in this e-book. 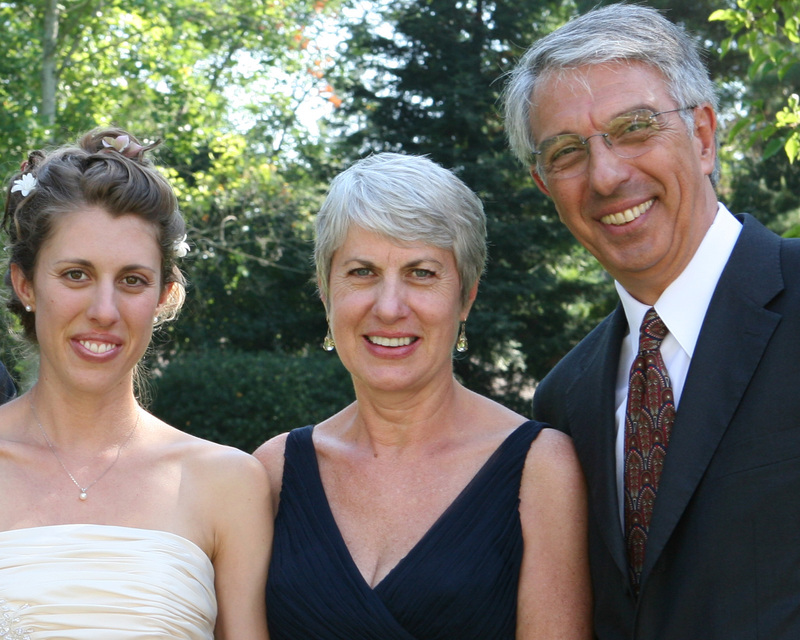 My name is Radomir Samardžić, and the success of these principles is evidenced by our daughter Diana who is happily married and has a Ph.D. in Clinical Psychology. My wife Antoinette and I are as proud of her as she is of us. Antoinette is a RIE (Resources for Infant Educarers) graduate and associate who helped us understand what a difference showing respect to babies can make in later life. In the course of years I have helped many families reestablish healthy relationships with their children. I am also the author of The Relationship Saver and The Gameless Relationship which have sold more than 75,000 copies worldwide in three languages and saved thousands of relationships. Parenting, The Joy of Doing It Right has only ten principles and it can be read in an hour or so. But it will be your constant companion and a reminder not to do what most people have always done, i.e., make the wrong choices on a daily basis in communicating and relating to your children. Being a parent is hard enough. You don’t want to be immersed in an unhealthy relationship with your child and open the door for possible headaches later on. This is not a “how to” book. It is much more than that. They say that smart people learn from their own, or even other people’s mistakes, but only very intelligent people learn from principles. Why? Because healthy principles always underline a foolproof system applicable to ANY situation. Think of the 10 Commandments. They are the principles that survived the test of time and that have guided millions of people in every walk of life throughout the millennia. Parenting, The Joy of Doing It Right stands alone. I don’t bombard you with a bunch of ideas that might help. I’ve cut away all the fluff and fully outlined only ten proven principles. Follow the simple, results-based strategy inside the book and you can handle almost any situation, no matter how dire it is. You won’t be forced to wade though page after page of what exactly to do in this or that situation. There are millions of those. No one can remember nor follow all the “techniques”. You’ll jump right into clear-cut principles applicable in any and all situations and you’ll discover exactly what steps to take to deal with any challenge your child may present. • What do babies need the most? • What are the different ways of listening? You think you know? • When is communication possible and when is it not? • Who respects whom, how and why? • When can a child be trusted? • What kind of parenting will you adopt? Can you choose? Does it change and if it does, how? • What does showing either respect or disrespect actually mean? • How does friendship figure in your relationship with your child? • To punish or not to punish, that is the question. • What are “boundaries,” how to make them, keep them and enforce them, and when to drop them? • What is a child’s learning process and how to engage them with ease. • Good toys and bad toys. Hmmmmm? • What it means to have a so-called obedient child. • Are you a teacher? No? Think again. When to teach and when not to. You’d better know that one. • If you learn this one thing from your children you may attain happiness and even be on your way to enlightenment. • What drives children to behave the way they do. • How children learn the best, what and when. • What is the one thing that triggers a child’s insatiable urge for learning? • How much of a child are you? Do you know? • What are you responsible for and what you are not responsible for as a parent. Find out. • Unconditional love! What is it really? How to achieve it. You will get access to it. • How to understand teenagers. It may seem impossible. But wait, there is a way. • What is the best compliment for your parenting that you can get from your child. • Should you avoid confrontation with your child? You probably cannot. But you can have confrontation without leaving anyone with a sour taste in their mouth. • How do you know if you succeeded as parent. • What is the one underlying principle that if absent, no other principles would work. As you can see, this contains some powerful distinctions and useful advice that you will find nowhere else. It’s hard to put a price on something this powerful. You could spend a lot of time reading hundreds of pages of other books (and I don’t say you shouldn’t) but you will not find such succinct information that goes so deeply into the issues of every parent/child relationship, certainly the most important relationship one has the privilege of having. 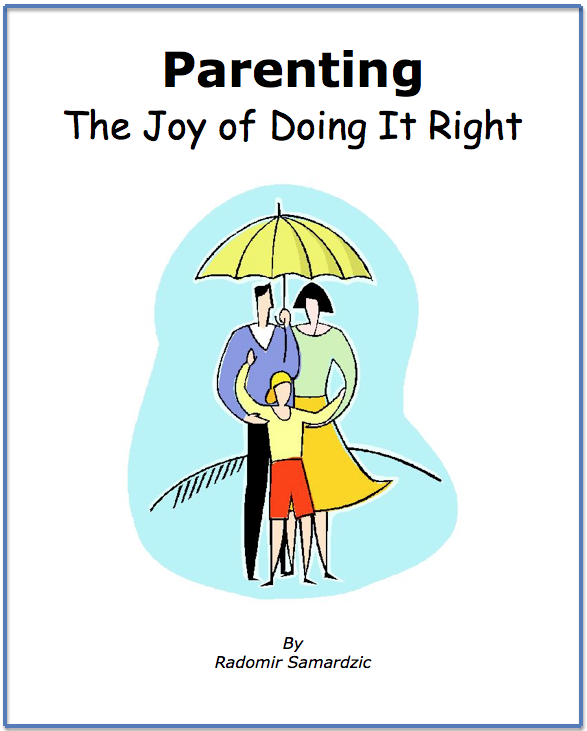 Download the Parenting, The Joy of Doing It Right for just $27.00, spend about an hour reading it and your eyes will be opened. You will know exactly what action to take and when not to act. Your life as a parent will be much easier with less worry and frustration and more quality time with your child. It does not matter how bad your relationship with your child has been. This book will show you the foundation upon which a different and solid relationship with your child can be built. You have nothing to lose. If you truly want your relationship with your child to flourish, then I want you to remember this day. Because today determines the future of your relationship with your child; take action today and you can change what tomorrow brings. Do nothing today and tomorrow will look no different. If you don’t find the information in Parenting, The Joy of Doing It Right useful I will refund your money. The worst thing that can happen is that you get every cent of your money back. But think about the best thing that could happen – a happy, healthy relationship with your child that could last the rest of your life. If you truly want to have a great relationship with your child, then I want you to remember this day. Because today determines your future together. Take action today and you can change what tomorrow brings. Do nothing today and tomorrow will look no different. You have nothing to lose. And you stand to gain a happy, healthy relationship with your child. So download the Parenting, The Joy of Doing It Right right now and take the first step towards a warm, lasting relationship with your child. 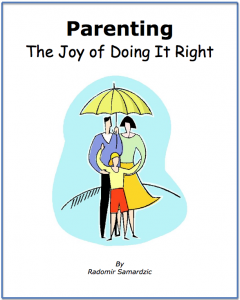 You can get your copy of Parenting, The Joy of Doing It Right Instantly. For Your Security, All Orders Processed on a Secure Server. Download the Parenting, The Joy of Doing It Right today and start having a great time with your child. In the process your child will become a healthy and responsible adult and you will grow with him/her. I have skimmed the book, but will be giving it many more reads! My first impression is that it requires a great deal of "higher level thinking", I like that it's principle based. Thanks so much for your interesting and insightful book. Thank you Radomir – I read the book yesterday and found that it contains excellent principles. Along with your “The Relationship Saver” and articles on Unconditional Love, you provide a great foundation for conducting your life.